THAT more than one-third of all that consumers pay for merchandise is paid for physical distribution--for transportation, rent, and the costs incidental to the physical distribution of goods from the moment of their first production to the time and place at which they are finally consumed--is a fact which deserves consideration if for no other reason than because of its aggregate cost. Assuming that we spent $35,000,000,000 in the year 1923 for merchandise purchased at retail, then the total amount paid that year for the physical distribution, according to Table IV, was between eleven and fourteen billion dollars. The amount paid for transportation is the biggest single item of cost included in the public's bill for physical distribution. The amount paid to labor for work in stock rooms, shipping departments, and similar branches of physical distribution, is probably second in importance. Rent paid for warehousing, including rent for so much of the space in retail stores used for the storage of goods as distinguished from the selling of goods, is probably next in importance. Other large payments which are properly chargeable to physical distribution, in whole or in part, include the interest and profits on the capital used during the transportation and storing of the goods, taxes, insurance, depreciation, and distribution overhead. If present methods of distribution involve cross hauling and unnecessary transportation and require longer periods of storage than was the case fifty years ago; if multiplying of brands has resulted in merchandise stocks which are larger in size, carried for longer periods of time, and "marked down" more than in the past, then the cost of physical distribution in the aggregate might be higher today even if freight rates, rentals, and other items of expense were lower. We may have reduced the ton-mile cost of transporting freight, but at the same time may have increased the average miles per ton shipped so as to completely wipe out the saving and to actually increase the transportation cost on each ton of merchandise we consume. But freight rates have not been lowered. Freight rates, rentals, wages, and nearly every overhead expense have risen, and in addition, consideration of present methods of marketing will force us to the conclusion that these methods result in unnecessary transportation; unnecessary labor and storage expenditures; unnecessary increases in stocks of goods; unnecessary depreciation. Freight rates are generally recognized as important factors in the economic life of farmers and of all producers of raw materials who market their products F.O.B. the points of exchange and conversion. If the farmer's wheat is worth $2.00 per bushel F.O.B. Chicago, it makes a great difference to the farmer whether the freight from his shipping point to Chicago is twenty cents or thirty cents per bushel. The higher the freight rate, the less there is left out of the $2.00 for the farmer to spend. That is obvious. But the great importance of the relationship of freight costs to consumer prices is not generally recognized. The fact, for instance, that the amount paid by the retailer for freight for a single suit of clothes is obviously too small to play an important role in the dramatic rise in the cost of distribution is responsible for the neglect of this factor in distribution. As a matter of fact, the freight paid on a suit of clothes on its final movement from the manufacturer to the retailer is the smallest item which must be charged to the cost of transporting it. According to the Joint Commission of Agricultural Inquiry, the buyer of clothing pays seven distinct transportation charges on the wool used in the suit of clothes in the course of its movement from the sheep's back to the ultimate consumer. Many of these payments for freight are made on the wool before it is fabricated into the suit which the consumer buys. The early freight payments are pyramided four or five times before all the freight payments are finally "frozen" into the suit by the clothing manufacturer and the retailer and then passed on with the retailer's final mark-up to the ultimate consumer. And--as clothes happen to be one of those products which are shipped direct to the retailer by the manufacturer--and so are not transshipped from a wholesaler to the retailer--it is probable that men's clothing carries fewer freight charges than products which are handled by jobbers. This process of pyramiding which multiplies every cost, necessary and unnecessary which enters into production and distribution prior to the time goods reach the retailer, is a phenomenon which it is important to fully understand. Freight rates are important in themselves, but pyramiding makes them doubly and trebly important. All the factors in distribution "mark up" the goods passing through their hands by a percentage which covers their cost of doing business and the profit which it is customary to make in their line. The average retail grocer pays out for help, rent, delivery, and other items of expense, from eighteen to twenty per cent. of the volume of his sales. He must therefore mark up what he buys at least twenty-five per cent. on his cost price in order to receive a price which will cover his expenses and yield him a return upon his investment. What is true of the retailer, is true of every factor in distribution. Each one secures a mark up on the goods passing through his hands. Each factor's mark up is a percentage of the price paid for the goods sufficient to cover his cost of doing business and the profit which it is customary to make in his line. This is true even in the case of merchants buying and selling raw materials at prices which are made on exchanges and definite markets like the cotton exchange, the wheat pit, and the wool auctions. The price at which they buy and the price at which they subsequently resell may be fixed by forces beyond these merchants' control. And yet they secure what is the economic equivalent of the retailer's mark-up because of the difference between the market prices in their primary and in their secondary markets. What is the genesis of the mark-up? Why does the average grocer use a mark-up of 25 per cent. ; the average shoe dealer and the average hardware dealer, a mark-up of 40 per cent. ; the average druggist and clothier, a mark-up of 50 per cent. ; and the average furniture dealer and the average jeweler a mark-up of 100 per cent.? Because there is a normal cost of business for each factor in distribution and for each type of distributor. This cost, plus whatever net profit is necessary to attract the number of factors needed to do the work, determines the average difference between prices in primary and secondary markets. Mark-ups by retailers, as for example by grocers, and by each factor in the process of distribution-elevators, millers, wholesalers, retailersdeviate only slightly from the normal average mark-up in each line. Why? Because (between the upper mill stone of competition and the nether mill stone of cost-of-doing-business, each individual factor is forced, under penalty of failure, to operate upon a margin not very different from that which general experience has shown as necessary in his line. Eliminating an independent factor by integrating distribution does not eliminate his cost of doing business, and in very few cases does it eliminate the factor's profit. The department store which eliminates the dry goods jobber and buys direct from manufacturers is not enabled thereby to deduct the jobber's margin from the price of the goods it sells. The difference between the price at which it buys direct and the price at which it sells to the consumer is substantially the same as the combined margins of the jobber and the small retailer. The shoe manufacturer who opens his own retail stores does not eliminate the independent retailer's and the independent jobber's margins as long as he sells his shoes at prevailing retail prices. The supertrust which produces the raw material, fabricates and sells it to the ultimate consumer does not eliminate any of these margins because it has no reason for selling below the market. As long as there is free competition in the sale of any commodity and prices on the bulk of it are established in free markets, the process of pyramiding will result in passing on to consumers all freight or other costs plus progressive accretions, which in the aggregate adds enormous sums to any wastes in production or distribution. Pyramiding makes each dollar added to the price of a product early in the process of distribution more important than any dollar added in the later stages. An unnecessary dollar of cost in the production of raw materials, or in the transportation of the raw materials before they are fabricated, will cost the ultimate consumer much more than a dollar for unnecessary expenses added by retailers, because the dollar added by the retailers is not pyramided by a subsequent mark-up, whereas the unnecessary dollar added in the early stages of distribution is marked up by each middleman through whose hands the product afterwards passes. The greater the number of mark-ups in the distribution of a product, the greater is the importance of eliminating waste early in the process of distributing it. The tremendous importance of the pyramiding of transportation costs is made clear by Table V, which shows how the mark-ups progressively in crease the transportation cost before it is finally fixed in the price which the consumer pays the retailer. * Table showing total cost to consumer for transportation of one dollar's worth of corn flakes from farm to elevator and from factory to wholesaler, based upon an analysis of figures in the report on "Marketing and Distribution" by the Commission on Agricultural Inquiry. 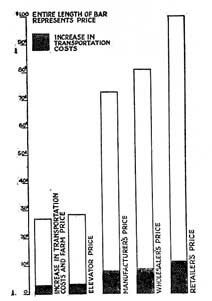 Table V shows that the 5.9 cents, which it cost to transport a dollar's worth of corn flakes between the farmer and the elevator, pyramided to 21.891 cents by the time the consumer paid for it, while the 9.1 cents, which it cost to transport them between the manufacturer and the wholesaler, pyramided to 12.49 cents. The actual sum paid for transportation amounted to only 15 cents, but the mark-ups by the various factors involved added 19.381 cents to that sum, making the total cost of transportation for which the consumer paid 34.38 cents. Increases in freight rates assume a new importance when viewed in the light of this phenomenon. Under modern conditions goods are shipped and reshipped so often in the course of production and distribution that any general increase in freight rates is certain to increase the level of prices to a much greater extent than is recognized. The really serious aspect of the various increases in freight rates since 1913 is evident from a study of Table VI. * Table showing cost of consumer of increase in transportation costs on one dollar's worth of corn flakes. In 1913, the cost of transporting one dollar's worth of corn flakes from the farm to the elevator was 2.9 cents. By 1921, the cost of transportation had increased to 5.9 cents. The cost of transportation at this early step in the distribution of corn flakes increased three cents in eight years. 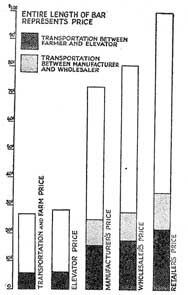 As this increase in the cost of transportation was pyramided by each of the factors subsequently involved in the distribution of the corn flakes, it was passed on to the consumer not at the original three cents but at an increasing progression, varying with the margins upon which the various factors involved operate their businesses, until it amounted to over eleven cents. This is graphically shown by Plate VI. It will be seen that the increase of three cents in the transportation cost at the very beginning of the process of distribution, after four markups, actually resulted in the consumers paying over eleven cents when buying corn flakes--nearly four times the amount of the increase. We are thus brought face to face with the startling fact that on an article of such wide spread consumption as corn flakes, the consumer paid for this increase in transportation charges more than 50 per cent. of the total amount he paid to the retailers for their services in supplying him with corn flakes when and where he desired them. In order to save consumers a sum equivalent to what they paid for that increase in transportation costs, wholesalers would have to carry on business for nothing and in addition lose nearly three cents--rather a high price to ask them to pay for the privilege of handling a dollar's worth of corn flakes. Or retailers would have to cut their entire cost of doing business, including their profits, about 60 per cent. in order to save their customers a similar sum. Elsewhere I refer to the tendency of manufacturers to broaden their markets and to invade territory which is not naturally that in which the manufacturer can market his product most economically. Theoretically, the lower unit of cost of production which is made possible by increasing the volume of sales in this way should more than offset the increased cost of marketing and the greater average distance his product is transported. The only difficulty with this theory is that it rarely works out that way in practice. If the local manufacturers, in what might be called the "foreign" territory, were quite content to leave the invading manufacturer in undisputed possession of the business in the invader's home territory, all the business which was secured in the foreign territory would tend to lower the invading manufacturer's cost of production. If Chicago manufacturers could secure a thousand desirable outlets in New England in addition to those they supply in their own natural territory, they could probably lower their cost of production sufficiently so as to quote prices F.O.B. New England in full competition with Boston. 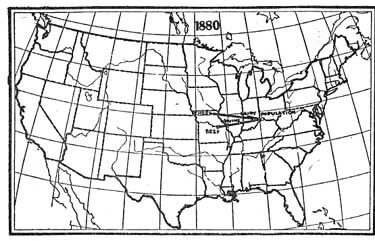 If, however, the Boston manufacturers at the same time secure one thousand desirable outlets in the Chicago manufacturer's territory, isn't the net return a mere exchange of accounts between the two groups of manufacturers? Both groups after the invasion of each other's territory travel their salesmen and ship goods more than a thousand miles more than bef ore. Every distribution cost in consequence is raised, and the higher costs are applied not only to the sales in the distant markets, but also to the sales in the local market which have not contributed to the higher selling costs. The net effect of the present day fight among manufacturers for the national market is to increase enormously unnecessary transportation of merchandise and to greatly increase expenditures for selling, since salesmen and advertising costs increase enormously as they work further and further from their home territory. Yet as a rule we are so dazzled by the spectacular economies of mass production, that we refuse to face the fact that marketing extravagances in many industries eat up all that mass production saves. It has always seemed absurd to me that Kansas farmers should ship wheat to Minneapolis, and then have flour shipped all the way back from Minneapolis to Kansas. Local mills, even though it costs a trifle more for them to make flour than it does the mass producers, are able to save considerable sums out of the differential which freight alone gives them. Yet in the milling of flour--which lends itself so admirably to local production--we have drifted into a state of affairs where ten of the national mills are able to supply fifty per cent. of the consumption of the country. The crowning absurdity seems to me the shipping of Oregon apples across the continent to supply the New York market--a market which is supplied with as luscious fruit by local producers, but which pays a premium for Oregon apples--well, because the Oregon producers are better advertisers than the New York growers. This is a thing which is easy to understand, but impossible for an intelligent people to justify. A monograph dealing with the marketing of live stock and meat issued by Armour's Live Stock Bureau, Chicago, Illinois, contains four maps which illustrate very graphically the tendency of commodities to carry a greater burden of transportation costs today than was the case previously. 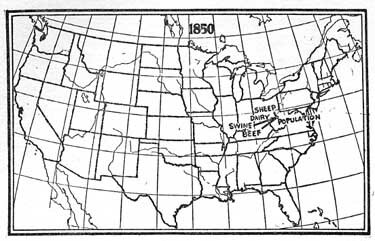 The map of 1850 shows the distance between the center of population and the centers of production of dairy products, sheep, swine, and beef. 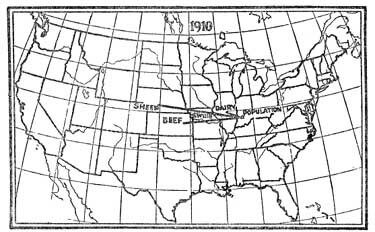 The map of 1880 shows how considerably the distance between these centers had increased in thirty years, and the subsequent maps for 1910 and 1920 show how enormously greater is the distance most of these commodities are being moved today. 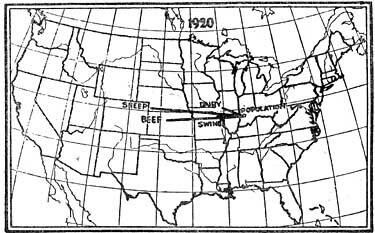 In the case of the products of the meat packing industry this increased distance which the meats can be shipped is both a cause and a consequence of the development of elaborate refrigerating shipping systems. The development of the refrigerator car made it possible to ship fresh meats great distances. In turn, the possibility of shipping from Chicago enabled the great meat packers to undersell the local meat packers section by section. As a result, we now have the absurd system whereby the raw products of an industry, in this case the live stock, are shipped great distances to the meat packing centers and then, after being slaughtered, shipped equally great distances back to the point of origin. There is apparently a greater justification for stupidly long hauls in the case of live stock itself than in the case of many other products, because the less sparsely populated sections produce the raw material of the meat industry--live stock--more economically than it can be raised in the densely populated sections. The justification for it, however, would undoubtedly be wiped out if the relationship of terminal costs to long distance hauls were changed. There are good grounds for believing that terminal charges are disproportionately high. If the railroads of the country were to give to the problem of reducing terminal costs one-half the attention which they give to the problem of carrying long trains of cars long distances economically, there is little doubt that livestock could be produced near the centers of population at a saving over the combined low cost of production in sparse sections and long distance hauls from them. When it comes to products the manufacture of which can be carried on equally economically in many sections, the uneconomic national marketing of the products made inevitable by our present system of freight rates is an absurdity for which manufacturers, retailers, and consumers all pay in the long run. A single change in our basis of proportioning terminal charges and carrying charges, even though the national bill for freight was not reduced, would tend to reverse this process of centralization. Lower rates for short hauls and higher rates for long hauls would give local manufacturing a chance to exist, and by the same token, centralized manufacturing would cease to receive the subsidy by drawback which helps it to overcome its inherent disadvantages of distance and location.